Join the discussion on our forums! 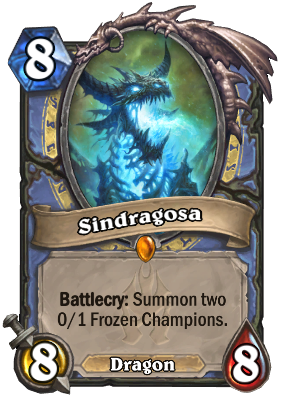 Come discuss Sindragosa over in our dedicated Sindragosa discussion topic. WARNING: The Champions MAY NOT explode! It's a good card, but i feel that Medivh is a better tempo minion than Sindragosa. Solid? 45% say it's very good but I've yet to see her played once. She's outclassed by Lich King and Medivh. 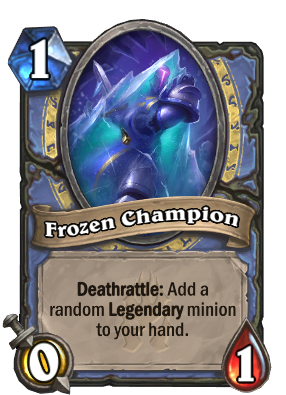 The Frozen Champions are nice targets for Frost Lich Jaina's Hero Power. Wish the Frozen champions were taunts. But we need a bit more good cards for the archetype to become viable. Just opened it golden, does it see play? Yes it does. Reno Mage in wild, and Elemental DK Mage in Standard. You'll need the Mage DK card first. Depends. If you have mage DK or planning to get it, keep. Otherwise, you should probably dust her. The obvious synergy with Icy Touch can produce some surprisingly well late-game advantage. Frost Lich Jaina can make some use out of that card not only you get Water Elemental but also a legendary minion and all of that for 2 mana! Used to be a fire dragon... poor viserion. The golden animation is glorious! While I am still missing this one, I was just able to Glimmerroot one & Shadow Priest a Champion from Jaina in the same match. If you don't have a way to deal with it, Frost Lich Jaina can take you out so fast. "Suffer, mortals, as your pathetic magic betrays you!" My god, that flavor text. Sindragosa was NOTORIOUS for her irritating voice line in her WoW encounter, "Your pathetic magic betraaaaaaaaaaaaaaaaaaaaaaaaaays you! ", which she said in the most horrific, ear piercing way possible several times an encounter. Sindragosa on Heroic was also usually a pretty long and repetitive fight before you got to the final phase, which was the only difficult part. You heard this line REPEATEDLY. Killing Sindragosa on Heroic was not cause for celebration; it was cause for relief, because you could now only hear those stupid lines very briefly once a week. Easily, some of the worst voice acting in anything EVER, and it ruined the encounter.